2.) Smooth tiles or Concrete wall, marble surface, natural stone surface which have been done waterproof processing. Note: The bearing capacity of the sucker varies slightly from the material of the adsorbed surface. Not applicable to: wallpaper/painted walls, wood and plywood without smoothed surface, bricks, pattern tiles. Made of highest class environmental-friendly ABS material,waterproof and non-aging for a long lifespan.NBR Rubber Suction Cup creates a strongly effective suction mechanism , offers you a super strong suction power of maximum 10lb vertically to absorb on the smooth surface, never budge, never fall down suddenly. TOGU Company Provides high quality and reasonable price houseware and hardware, we sincerely hope that we could have the honor to contribute all our intelligence and effort to work together with you to make your home comfortable, safe, relax and artistic. 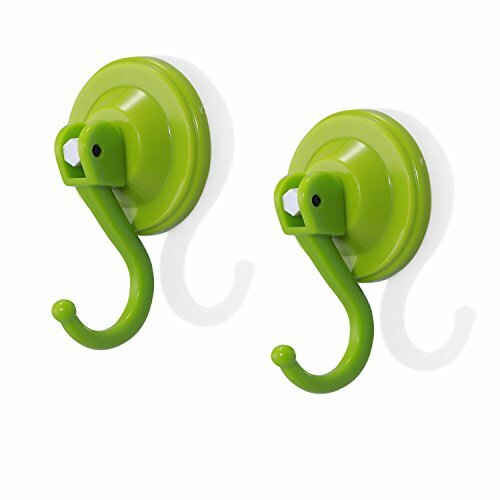 1.No Tools, No Drilling, No Screws, No Holes, No Removing Scratches On The Surface with Super Easy installation.--- Adopting vacuum adsorption principle, TOGU TG-SH Series suction hooks can easily adhere to any flat surfaces indoor and outdoor, keep your home organized and clean with a fresh, qualified natural candy color. 2.Super powerful 4mm/0.16-inch industrial NBR rubber suction cup traced powerfully by 2mm diameter durable SUS 304 Spring,these creates a strongly effective suction mechanism , TOGU TG-SH Series suction hooks offers you a super strong suction power of maximum 10lb vertically to absorb on the smooth surface, never budge, never fall down suddenly. 3.High Class Environmental-friendly ABS Resin Material with Utility Hook Design- --Not only offers a fresh candy color for your home decoration, but also features the hook freezing and heat resistance from -10~70 degree Celsius, waterproof and non-aging for a long life span. This series of hooks have Medium to Big Sizes, offering the most utility hook size for different organization needs. 4.Easy Installation and removable/Reusable function: Position the hook at a suitably positioned place on a smooth surface, twist the hooks clockwise from up to down, Just easy press, the hook locks strongly in the position you want to locate.To remove it, just turn the hook to be up forward again, the super strong elastic thick NBR rubber will turn to be flat again, you can re-use it wherever you want as a brand new one again. 5.Applicable Places: TOGU TG-SH Series suction hooks can easily adhere to any flat surfaces,such as smooth ceramic tiles, steel/iron/aluminum/acrylic plates/panels, refrigerator doors, indoor and outdoor windows. Ideal to be used as cup holder, key hook, handbag holder, coat/hat/towel hook/holder, Christmas Wrench holder, great for kitchen/wall organizer, bathroom storage. If you have any questions about this product by Togu, contact us by completing and submitting the form below. If you are looking for a specif part number, please include it with your message.